Drilling is one of the oldest production methods and has been used by humans since the Stone Age. Today, drilling is known to almost everyone, mainly because of the drill, and is used daily in the most varied ways. The principle of drilling is always the same: a drilling tool is turned around a vertical axis and pushed into the workpiece to be machined. The rotation is generally produced by an electrical motor and is transferred to the tool chuck (e.g. drill chuck) via a gear and a shaft (bore spindle). The feed is handled by the most varied methods; the drill is fed manually using muscle power, while in a machine tool the entire drill unit is controlled automatically. In all drilling processes, however, the drilling tool is moved while the workpiece to be machined is held in a fixed position. Drilling is applied by many EMAG machines. 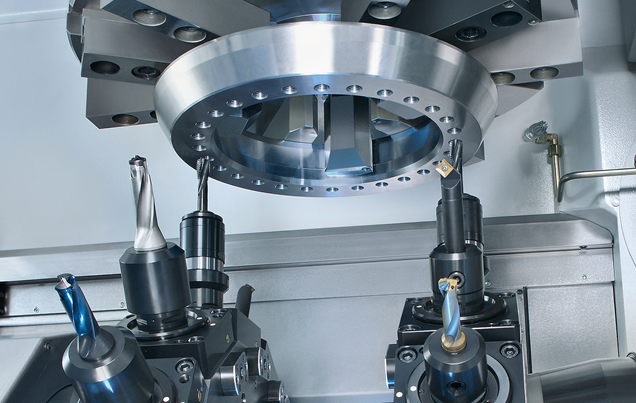 Depending on the requirements, drilling can be integrated directly into the machining process in a variety of machining scenarios. The drill, as a driven tool, can be integrated in the machine as a part of the tool turret. Of particular note are the VLC and VSC Series: vertical machining centers that provide multiple production solutions.